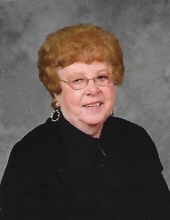 Age 83, of Bethel Park, passed away on April 1, 2019. Mary is survived by her beloved Husband, Kenneth A. Sharo; Son, David C. (Sarah) Sharo; Two Grandsons, Braydon R. Leakey, Connor D. Sharo; Granddaughter, Brienne J. Sharo; as well as niece, Patty Cook and her loving family. She was preceded in death by her Son, Robert K. Sharo. Mary was a life-long member of the Baldwin Community UMC and enjoyed playing tennis and swimming with her friends and family. She loved traveling and music. Mary was a devoted wife, mother, grandmother and aunt and will be dearly missed. Visitation will be held on Wednesday April 3, 2019, 2:00 pm - 8:00 pm at the JEFFERSON MEMORIAL FUNERAL HOME, INC., 301 Curry Hollow Rd., Pleasant Hills, 15236. A Funeral Ceremony will be held Thursday, April 4, 2019, 12:00 pm, at Jefferson Memorial Funeral Home, Inc. In lieu of flowers, memorial contributions may be made to Lord's Pantry c/o Baldwin Community UMC. Condolences may be left at www.jeffersonmemorial.biz. To send flowers or a remembrance gift to the family of Mary E. Sharo, please visit our Tribute Store. "Email Address" would like to share the life celebration of Mary E. Sharo. Click on the "link" to go to share a favorite memory or leave a condolence message for the family.